Research has found that a very high percentage of Varroa mites fall to the bottom board and then climb back up and find a host bee. When you open a hive to inspect it, a large number of mites fall to the bottom board. 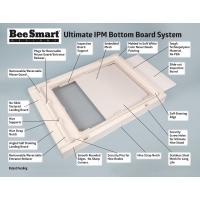 Smoking the bees increases the amount to fall through a screen onto your bottom board. If you have a sticky board (contact paper, oil or shortening coated sheet) the mites will be trapped and die. This is not the complete answer to mite control, but it definitely will reduce the levels in your colonies. 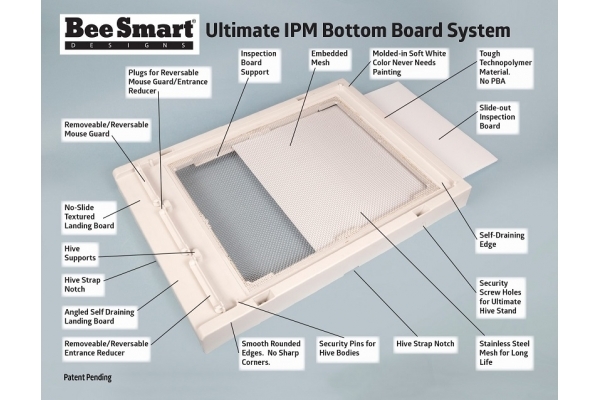 This product is part of an integrated approach to pest management (IPM) with fewer chemicals. Our tray slides out of the rear of the hive for easy cleaning, inspection or re-oiling or papering. This is done without opening the hive. Either of these boards can be adapted to beekeepers that are palletized. Comes with built in clips to hold hive in place, and entrance reducers that snap in place. made in the USA. These traps are superior to others in that they will never rot or need painting, provide for a full front landing area and, the tray or pad can be removed from the rear without manipulating the colony. Honey Super Commercial Grade 6 5/8"